​When Louis Le Prince, the inventor of the film camera, made the first real movie in 1888, he had hardly an idea about what would become of his invention. The very life of Le Prince would have been material for a movie. Introduced as a child into the technique of photography by Daguerre himself, the Frenchman Le Prince studied in Leipzig, worked in England and later became a US citizen. Two years after his groundbreaking invention, Le Prince disappeared without a trace during a train journey in France. And his camera was part of an economic drama just as worthy of a movie. In 1908, the Motion Picture Patents Company was founded in New York. Leading the way was none other than Thomas Alva Edison, a tough businessman who held all film patents for the US as a whole without ever having invented something on his own. The company had an oligopoly on films, cameras and cinemas and enforced their rights even with the help of thugs. As a result, New York filmmakers moved far away from the company to a small town in California called Hollywood. The rest is history. In the land of almost undiluted capitalism, legends became and still become reality. Of course this includes tales about big money, the base for several stock market movies, many of which are based on true events like day trading success, market collapses, misspeculation and bankruptcies. Stories of steep careers and bitter defeats centered around stocks, options, commodity futures and the rule of money. 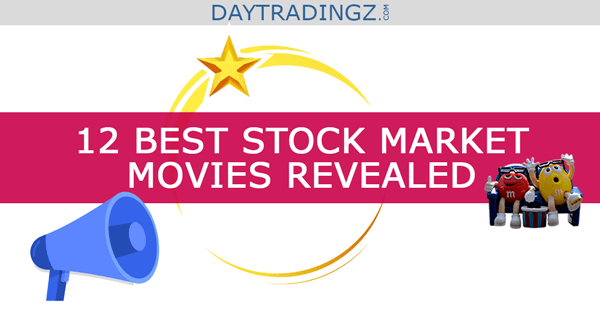 Here you will learn more about the most important stock market movies from the beginnings of the cinema until today. ​Of course, movies about the stock market, about entrepreneurs and enormous wealth are extremely interesting to the public. Who doesn‘t dream of juggling millions or even billions and simply being able to afford everything beautiful and exquisite in this world? Accordingly, all stock market movies are set in the world of high finance, with the scenery corresponding to the income of the main players. That‘s been the case ever since 1918. The very first motion picture featuring the stock exchange in its title came from Germany. Nevertheless, it was more of a love movie rather than one about big money. The director Edmund Edel filmed the story of a female mine owner whose mining shares fall and who knows how to turn this into her advantage. casting the silent movie star Asta Nielsen in the lead role. The contemporary story of the Wolf of Wall Street from 2013 was filmed in 1929 already, under the same title. At that time, George Bancroft played a stockbroker who gets rich with manipulated copper stocks and drives his friends to ruin. Incidentally, 1929 was the year of the first world economic crisis of the 20th century. This biopic movie traces the life and times of Thomas Alva Edison. In the title role, Spencer Tracy played the businessman, who caused international sensations with his inventions and company foundations, especially in the electricity supply sector, and of course made a splash on the stock exchanges. Edison was involved in many companies as a shareholder, including General Electric. Orson Welles in his famous role as a New York newspaper magnate. The black and white movie begins with the death of Kane in his castle Xanadu and his last word: "Rosebud". 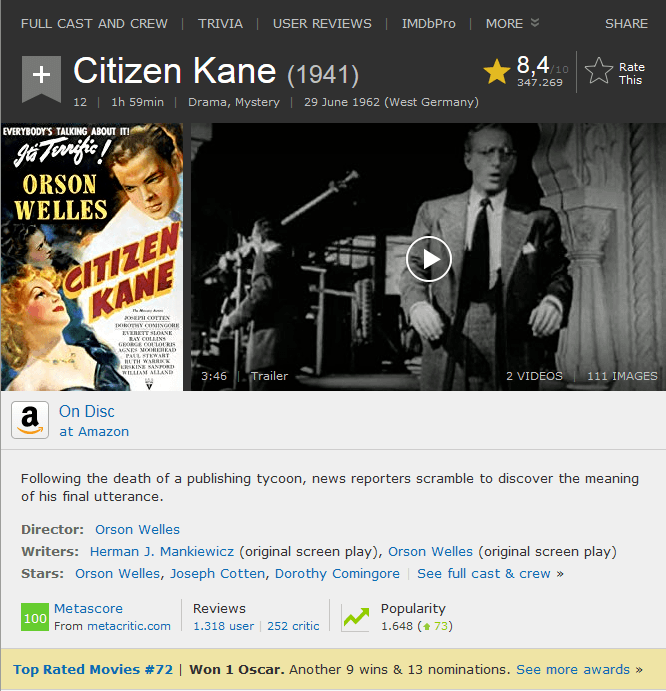 In the subsequent plot of the film,movie a reporter searches for the background for Kane's last enigmatic word, leading into the past of the newspaper publisher, who manipulated people and stock prices with his printing works. Welles‘s masterpiece, which initially received bad reviews, later became an iconic movie. The model for Citizen Kane was the publisher William Randolph Hearst. Rosebud, by the way, Kane's last word, was a wooden sled that he had to leave behind in his childhood. Eddie Murphy is a homeless man who is being made a financial manager by two successful stockbrokers because of a bet. His predecessor on the post, played by Dan Aykroyd, loses everything. Ultimately, however, the two team up and get even with the stockbrokers, who used them only as a means for their bet. In the end, they ruin the financial jugglers with orange juice contracts. A very entertaining and funny comedy based on a short story by Mark Twain, “The Million Pound Bank Note”. 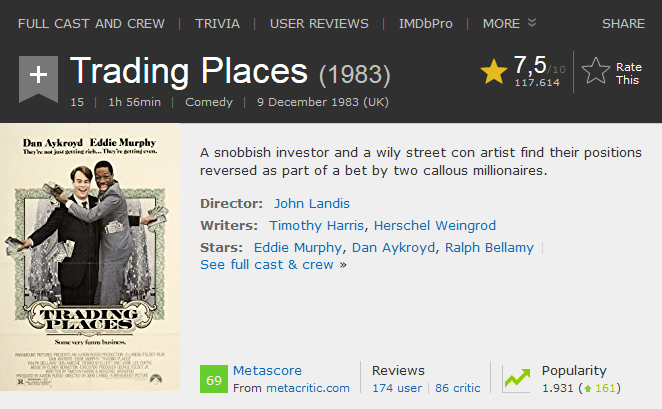 This is THE stock market movie par excellence, showing the glamorous, but also the dirty sides of trading in stocks. However, critics accused director Oliver Stone for painting the game of stocks and thus of people and their destinies in far too beautiful and appealing shades. In Wall Street, Michael Douglas is the financial shark Gordon Gekko, who prompts the young stockbroker Bud Fox, played by Charlie Sheen, to procure inside information about the company in which his father is employed. In the end, both Gekko and Fox end up in jail. Nevertheless, thanks to its scenic perfection, the film is likely to have enticed many young people enter the stock market. This movie is based on the homonymous book by Tom Wolfe and was directed by Brian De Palma. Both the film and the book outline the lifestyle of the successful New York stockbroker Sherman McCoy, played by Tom Hanks, living in a totally different world from the "normal" population of the US metropolis. A trivial car accident throws the financier into the mills of both the judiciary and the police, making him the scapegoat for a social class that illustrates like no other the chasm between rich and poor in the US. Here the fast money, incredibly expensive apartments right on Central Park and an eternal cycle of social events, there meager tenements full of people without health insurance. Brian De Palma translated the contents of the book with much irony and wit and did not skimp on skits against the American social and legal system. Hostile takeovers are a business practice typically used for bringing a joint stock corporation under someone’s control. In this comedy Director Norman Jewison, who also filmed the Southern State drama "In the Heat of the Night," is more concerned about highlighting the relationship between DeVito and the daughter of an entrepreneur whose company is his next takeover target. This movie, directed and with screenplay by Robert Connolly, is about a financial instrument that is very popular, but was misrepresented. It's about software that can predict stock market trends. A bank manager hires a mathematician who developed a software that charts the stock market trend. In the movie’s plot the software is used to gain insider knowledge. 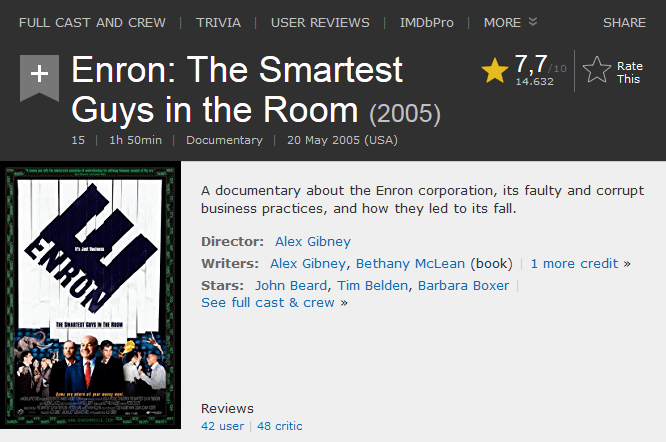 In this documentary, director Alex Gibney tells the story of ENRON, a US energy company that was responsible for one of the biggest economic failures in the US. Founded in 1985, ENRON was a playground to enrich themselves for the managers of the company until its bankruptcy in 2001. Ultimately, accounting fraud, money shifts and entrepreneurial adventures cost more than 20,000 people their jobs. In addition, the staff's pension fund of US$ 2 billion was plundered. In the end, ENRON's accumulated debt amounted to $ 30 billion. The sequel to the movie by Oliver Stone from 1987 deals with the life of Gordon Gekko, alias Michael Douglas, after his release and during the world economic crisis of 2007 / 2008. In contrast to the first part, however, the accent is more on the family relationships between Gekko's daughter and his son-in-law. Of course, there are great scenes, like when Gekko initially appears converted, preaching against stock market manipulation, then returning to his prior character, and finally taking his part in a happy ending as a benevolent father and grandfather. 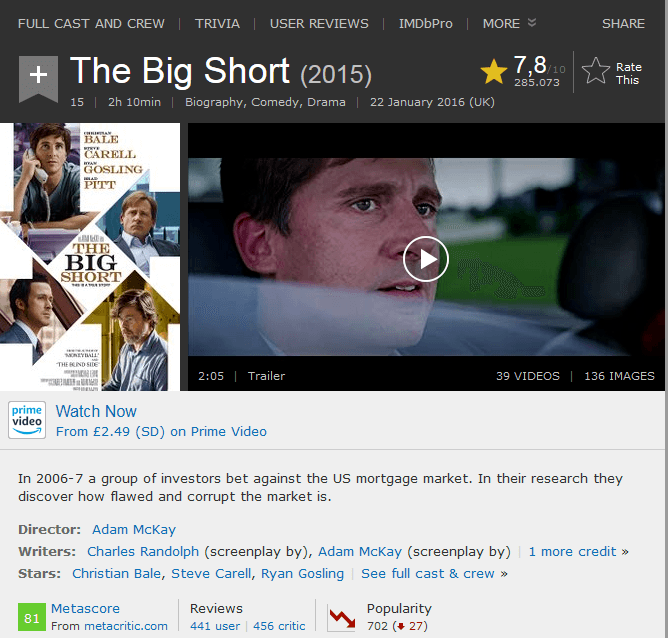 The film by Adam McKay describes in great detail the events that led to the financial crisis in 2007 and 2008. In the US real estate market created a huge bubble of mortgage lending that was extended to virtually everyone. As the film documents, it was even possible to borrow money in the name of one's dog. Hedgefonds manager Michael Burry, played by Christian Bale, recognizes the situation and foresees the coming financial crisis. But he also recognizes the possibilities and buys the credit summarized in so-called credit default swaps in order to bet on a price slump. His tactics work and on the day of the stock market crash his fund makes 400% profit. Nevertheless, he dissolves the fund. And rightly so, because in the following months the crash is drawing ever wider circles. However, the film also shows that the triggering banks as well as the supporting rating agencies got out virtually unscathed and were saved with taxpayers' money. Only a single bank manager is detained. In the States alone, eight million people lost their jobs as a result, around six million people lost their homes. ​Finance is such a complex matter that too much detail would be counterproductive. For example, which movie goer would care to know what exactly hides behind the already mentioned term credit default swaps? But it is just as true that banks and stock exchanges like to create financial instruments that ensure simply by their complexity that only insiders know what is going on. Watching the life and times of financial sharks, bankers and stockbrokers from the comfort of a sofa or cinema chair is certainly the most enjoyable way to immerse yourself in the world of high finance. The fascination of playing with big money can be enjoyed without risk of default. But it is often too beautiful a scenario that is enacted for the audience. Of course, Hollywood is out to produce stock market movies that are popular with the public and therefore viewed and re-viewed often. After all, the big Hollywood studios themselves are all joint-stock companies obliged to their shareholders. In this case too much reality might backfire.